The Deals of the Cyber Monday! At the ShoeBuy, you may take 20% off of your entire purchase and get the free shipping if you enter the coupon code “KICKOFF”. Perhaps it is time to finally buy those classic Blundstone 500 boots for your man? At the Shoes.com you may take 20% off of your entire purchase by entering at the checkout the coupon code “CYBER”. Perhaps you can reward your own hard work in the run-up to the holidays with new shoes. 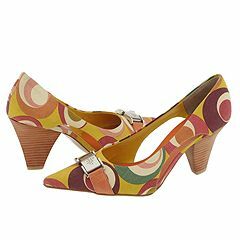 These beautiful and happy-making Pucci shoes are already discounted 60%, and you may reduce it another 20%! The Shopbop.com has the big discounts for the purchases, if you enter the coupon code “BIGEVENT” at the checkout. 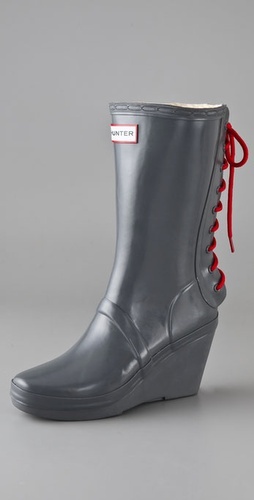 Your daughter, the stylish one, might very well appreciate these wedge-heeled Hunter rain-boots with the lace-up details. Of the course, many other retailers have the amazing Cyber Monday deals, retailers such as the Amazon, the Famous Footwear (coupon code “CYBER20”), the Soft Surroundings (coupon code “2211022”), the Brooks Brothers, and the Bluefly, also the Rock and Republic and the Kenneth Cole stores at the eBay. Manolo says, when ever the Manolo is suffering one of his “moods” (as he is at the moment) he naturally likes to cheer himself up by looking at the shoes, and nothing is as cheering as the wonderfully over-the-top Pucci. For the example, these parti-colored slingbacks with the bling are like the seratonin uptake inhibitors for your feets. Or, as the Manolo would choose to put it: Pucci Makes the Smiles! Manolo says, blogospheric controversy makes the Manolo sad. Emilio Pucci makes the Manolo happy! Beautiful Emilio Pucci sandals selling for nearly 50% off of the usual price makes the Manolo ecstatic! Manolo says, it is Monday and you are back at your desk slaving away for The Man and his Minions, slowly breaking your spirit into tiny pieces on the keyboard of your workstation, as surely as the convict turns the big rocks into little rocks with his sledgehammer. Oh, how you dream of freedom, fame, and great wealth, and of tall, bronzed, well-oiled men in tiny swimming trunks who bring you fruity drinks and peel plump grapes for your enjoyment. But then, at the peak of this daydream, just as Fabio leans into view, briefly obscuring the warm Riviera sun, you remember that there people who depend upon you, the hard-working husband and the two kids in school, who need you and the mighty efforts you expend to make their lives better. Yes, it is not glamorous, nor exciting, nor especially self-actualizing, this mundane reason for enduring the unsatisfying job, but it is, in its own way, noble. Serving those whom you love gives your life purpose and meaning, makes it possible to endure that which is difficult. Of course, sometimes, at least in your mind, you must cut loose and let your inner Joan Collins rage. Clad in the bright red Dynasty power suit with giant shoulder pads, you would teach that biotchy regional manager the thing or two about eye-scratching, hair-pulling, and cat-fighting. Ayyyy! Quick, we need happy-making shoes, and nothing makes the Manolo happier than shiny sandals from Pucci. Breathe deeply and enjoy the bliss. Pucci Shoes for the Monday! Manolo says, it is again Monday, you are back at your desk, and worse, the cold rain is arriving this afternoon to gloomify whatever remaining Halloween cheer you may have had. In such circumstances, one must do what the Manolo does when he is out bummed: look at the shoes! Above are the beautiful and dramatic chunky-heeled shoes from Emilio Pucci. 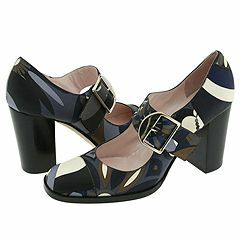 And, what better shoes to cheer you, for as we all know, Pucci makes the smiles! Manolo says, the platforms are out. It must be true, because the USA Today has said so. It took one swift kick from the new shoe trend — ballet flats — to topple platforms from their perch. It certainly helps that they’re easier to wear than the ankle-wrenching wedge, and they can look elegant or coquettish with this year’s empire-waisted dresses, hot pants and capris. And despite a more casual work attitude, flip-flops and sandals flunk many office dress codes, but flats won’t. Of the course, this is not news to the readers of the Shoe Blog, as the Manolo was predicting just this eventuality in February of this year. Although, to judge from the height and the color and the excessive strappiness we have moved from the restrained and classical period of the platforms into the final decadant period before they leave the scene for the few years. You have until perhaps the end of the year to enjoy them. And thus it came to pass. Manolo says, here is the most beautiful and elegant black patent and gold shoe from the Pucci. Yes, it is something different from the Pucci, as it does not employ or make reference to colorful Pucci pattern. But it is so beautiful, and look, the soles are made of gold! Or perhaps the golden metallic leather. In any event, Pucci makes the smiles! Manolo says, last week the Manolo noted with perplexity the entry of the NASCAR to the ladies designer shoes market. This week, the Manolo notes with dismay the Allison from NASCAR, the Pucci knock-off so blatant that the Manolo gasped when he saw it. 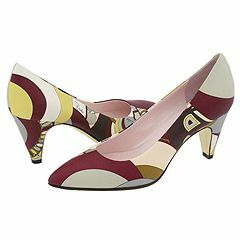 Manolo says, here to brighten your Thursday is the yellowy-reddish patterned pump from the Pucci. The form is so simple, but the pattern is the pure Pucci, which is what makes it so wonderful. Manolo says, here is the exceedingly cute a button thong sandal from the Pucci, the shoe designed solely to make you feel happy. The joy that comes from wearing Pucci cannot be underestimated, particularly in these days of dull mass produced sameness. That’s my kind of woman: a woman who sees value in herself and her attributes through her shoes. When you see a woman in a stylish dress with her hands hidden in the pockets, it only adds to the feminine mystique. Manolo says, in honor of the 60th Anniversary of the founding of the House of Pucci, the Manolo presents to you these super fantastic wedge sandals from the Pucci. As the Manolo has always said, Pucci makes the smiles!